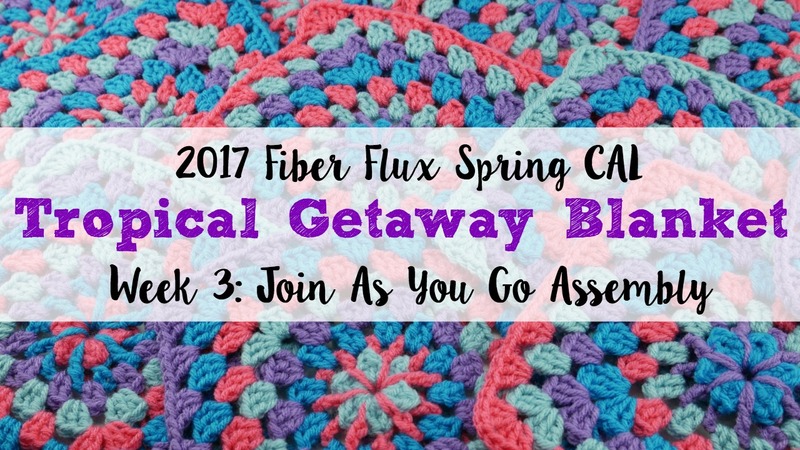 Welcome back for week 3 of the 2017 Fiber Flux Spring Crochet Along! Today we'll be learning how to join all of our squares using the "join as you go" or JAYGO technique for the Tropical Getaway Blanket, a classic granny square blanket. Just joining us? 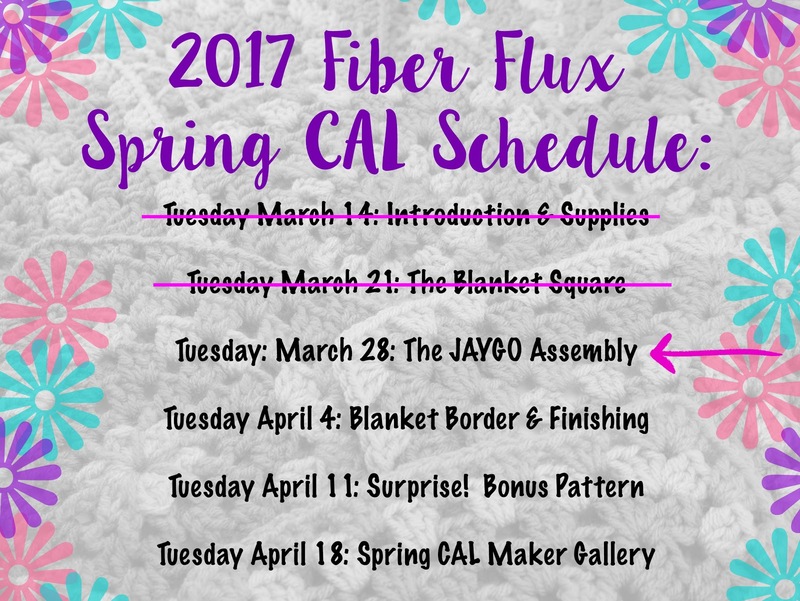 Scroll down to the schedule below where you'll find links for weeks one and two! Because there are those of you who prefer the written version and those who prefer a video tutorial, below are both. Either way, be sure to check out the video for some helpful tips as you are working on the project. I highly recommend the video too if you need a very detailed demo and explanation of the JAYGO technique. 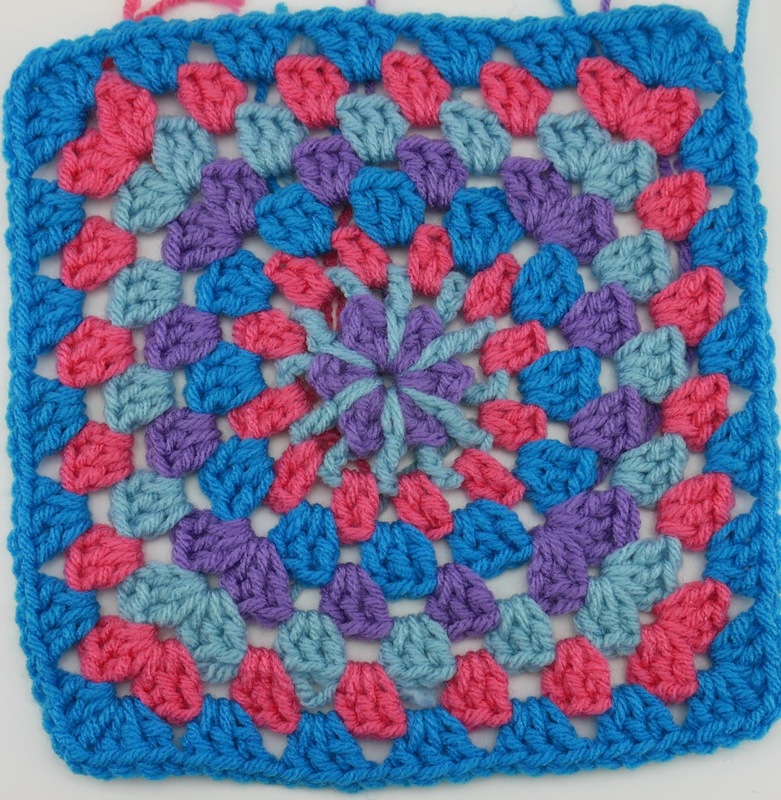 Last week we learned how to make the blanket square. This week, we'll be learning how to join them together using the join as you go technique (JAYGO). I have seen many different beautiful ways to join motifs as you go, this one is my go-to method...super simple and very quick to do. 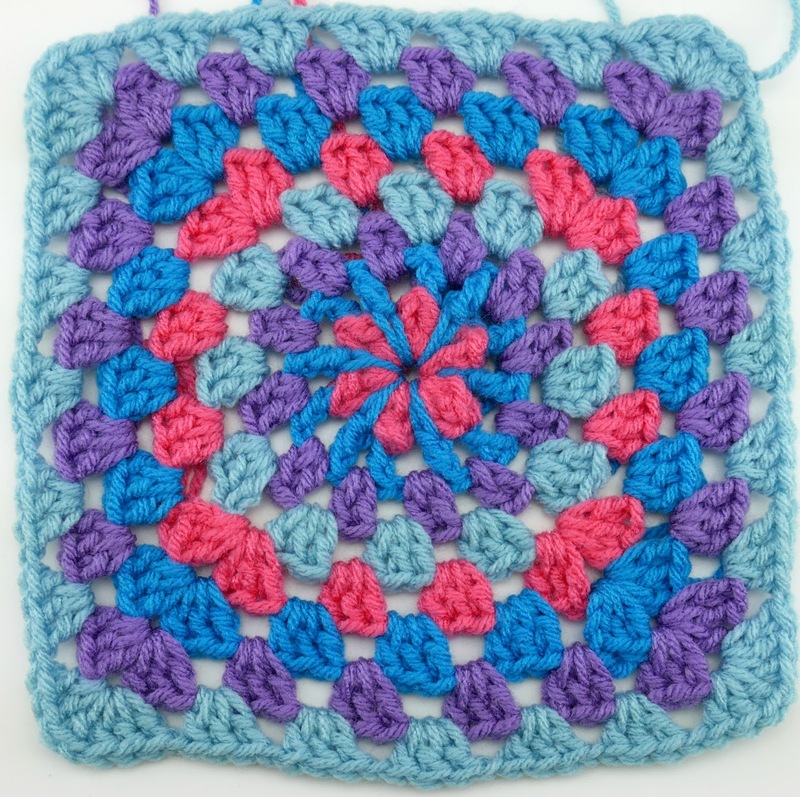 I especially love how it stays perfectly flat and shows off the granny square in a simple, clean way. Before you begin, you'll need a couple of squares...if you don't have them all completed, no worries! You'll only need a few squares to learn how to join them together. In the video I have a giant pile of them, but I only actively work on four of them to demonstrate the technique. Remember, this is self-paced so relax and make as many as you are able to. Note: It really helps to keep everything flat as you work, I like to lay mine on a table or lap as I go. Last week we learned rounds 1-8 of the square, this week we'll be simultaneously adding round 9 (shown in white) while joining each as the final round is worked. 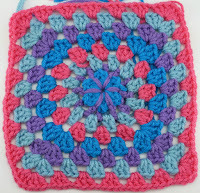 *Some of you have asked about square sizing, rounds 1-8 measures about 8 inches (height and width), after adding round 9, it is about 10 inches tall and wide. 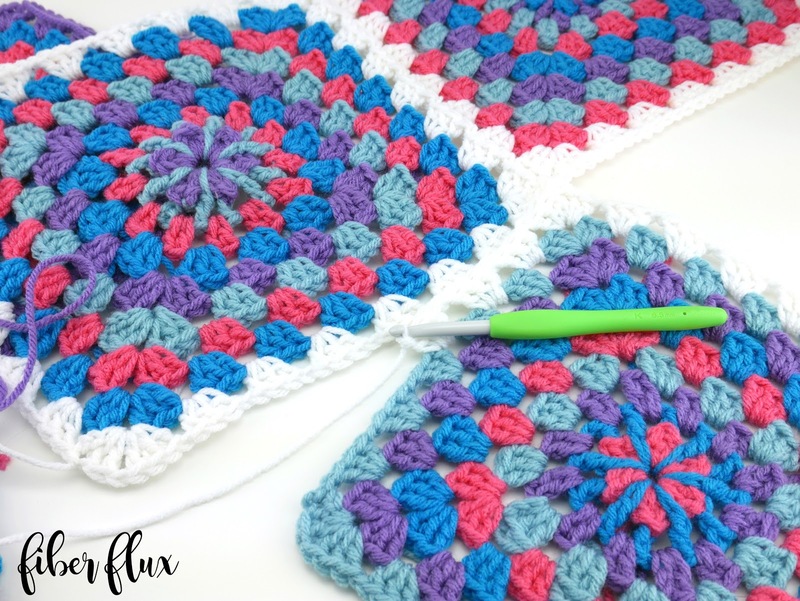 Tie a new color (I used white as shown in the photos) into any corner space of a square you've previously made and ch 3. In the same space, work (2 dc, ch 1, 3 dc). 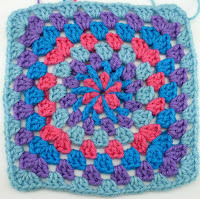 In each side space (there will be six of these if you are also working round 9 of the pattern. If you made a different number of rounds, your side space counts will be different) work (3 dc, ch 1). Repeat for each side space until you reach the next corner. In the corner space work (3 dc, ch 1, 3 dc). 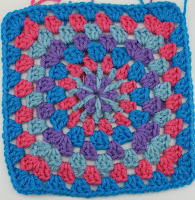 Continue around the square in this manner, working the side and corners the same way, then join with a slip stitch to close the round. Fasten off yarn. 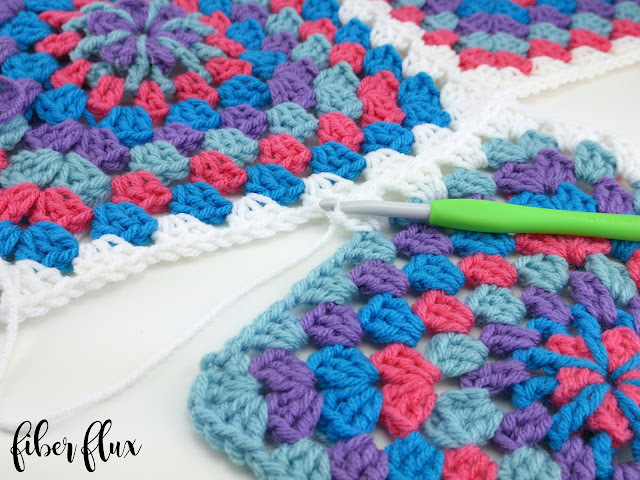 Grab a second square and tie on a new color (I used white as shown in the photos) into any corner space of a square you've previously made and ch 3. In the same space, work (2 dc, ch 1, 3 dc). In each side space work (3 dc, ch 1) You'll have 6 side spaces if you made the same number of rounds as mine. Repeat for each side space until you reach the next corner...this is where we'll make our first join. In the corner space work 3 dc. 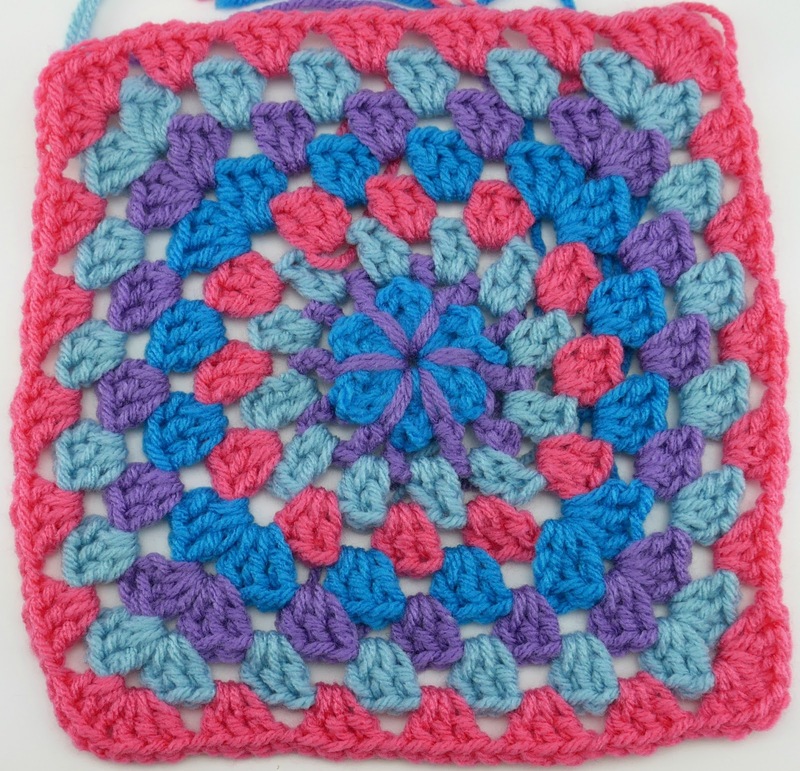 Instead of the ch 1, work a slip stitch into the other square' corner space, then work 3 dc back into the square. 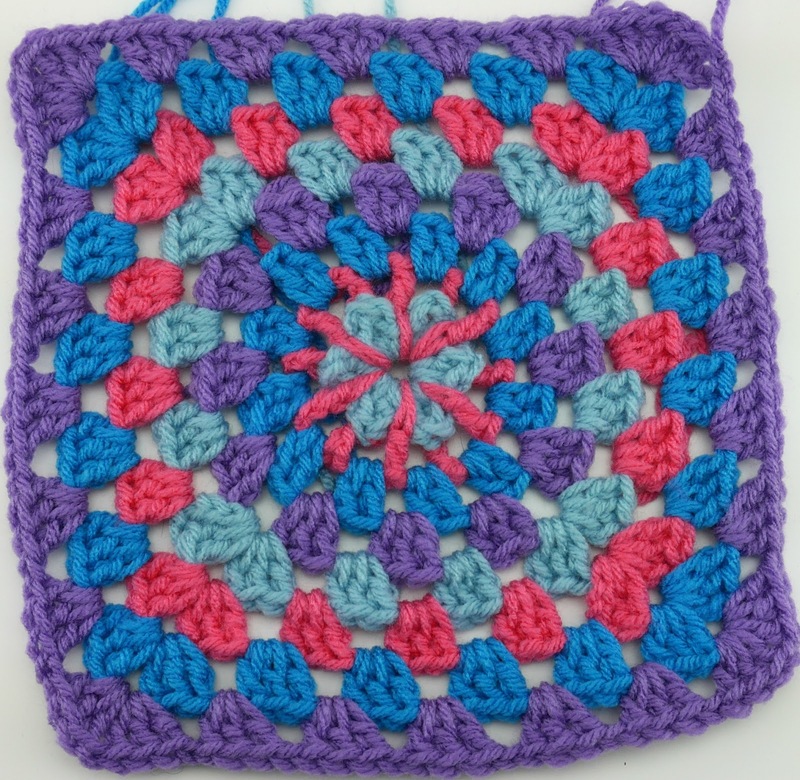 As you continue down the side of the square, work a slip stitch into the other square instead of a ch 1, and 3 dc into the side spaces of the square. 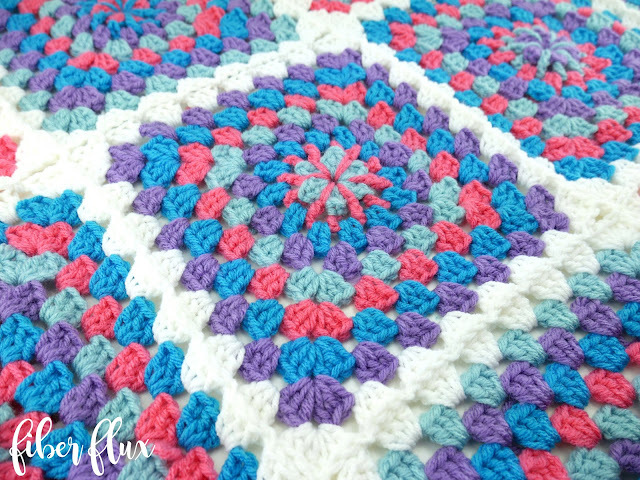 When you get to the next corner, work 3 dc, slip stitch into the other square's corner space, then 3 dc into the corner to finish the joining. Work the rest of the square the way you normally would (3 dc, ch 1in each of the side spaces and 3 dc, ch 1, 3 dc in the corner). 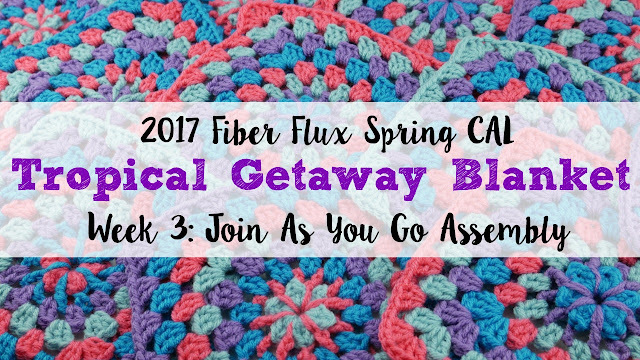 Join with a slip stitch to close round, fasten off yarn and you're ready to join another square! 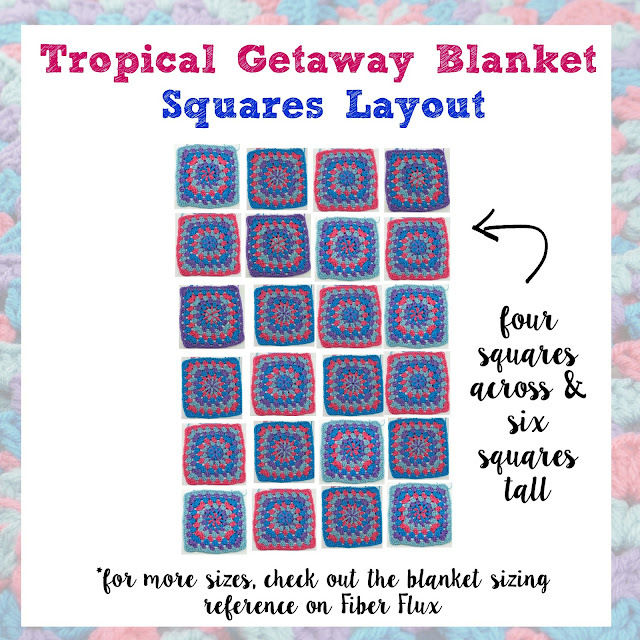 Below is the layout I'm using, however you can configure your squares any way you like! 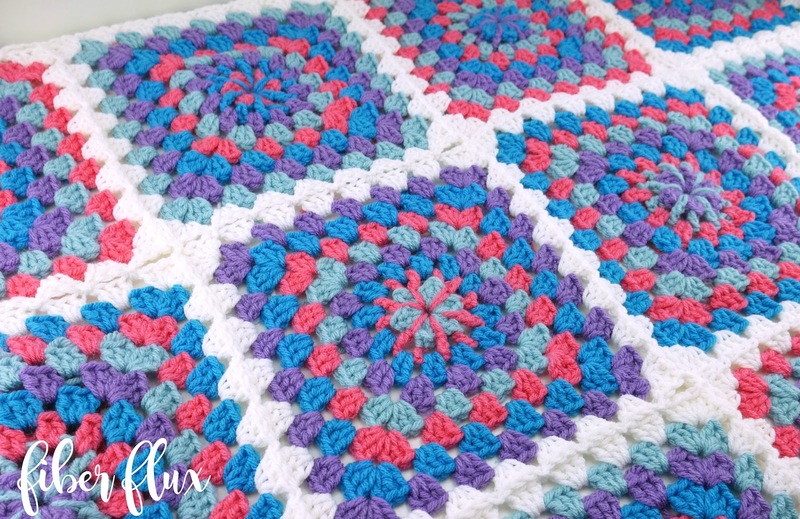 When joining, you'll want to mix up your squares a bit for the biggest visual impact (unless you've chosen to do all the squares the same, and that looks lovely too!) Check out the color combinations I used in the photos below. Tuesday March 28 (that's today! ): How to join squares with the join as you go technique (JAYGO), helpful tips for using the chart to plan your work. 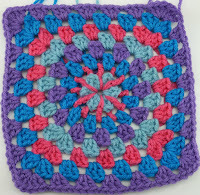 Tuesday April 4: How to add an edging to "frame" in your squares, finish work on the blanket.